Recently I warned you that robot overlords will be taking over. First step? They’re cute and useful. Then we can’t bear to think of living without them. Soon, if my research holds true, we humans are well on our way to becoming fuel for angry, meat-eating, self-perpetuating machines. I’m here to report that I have become a willing victim. Yes, I’m weak. When given the opportunity to get a review sample of the Neato XV-21 Pet & Allergy Automatic Vacuum Cleaner I took the chance to observe a robot up close. Maybe knowing my enemy better could help me in some dystopian robot-controlled future. Besides, it’s not like I need the help. I barely do any chores around here due to my super responsible kids. Let me tell you, those kids were excited when the box arrived. Because the instruction book noted a large open wall was best for a docking station, my family insisted it get a prime spot in our front hall where every visitor can now see who dominates the home. Our robot. The Neato XV-21 is a compact little machine. It operates using “laser-based vision.” Each time it is turned on it scans the room with laser eyes, mapping the layout. It has no trouble clambering from carpet to tile, or from room to room. Cleaning it is surprisingly easy. Open the filter, empty the dust bin, snap shut. Takes 30 seconds. And the operating options are also simple. But we couldn’t just call it a robot or XV-21. No, the humans here insisted it have a name. Proposals included Vacuumus Aurelius, J. Edgar Hoover, and Locutus of Floor. Locutus won. Also, the little thing has become a “him.” I will try to pretend I still call Locutus “it” for the purposes of this review but this is harder than you might imagine. From the first time we first ran the Neato XV-21 we were impressed. 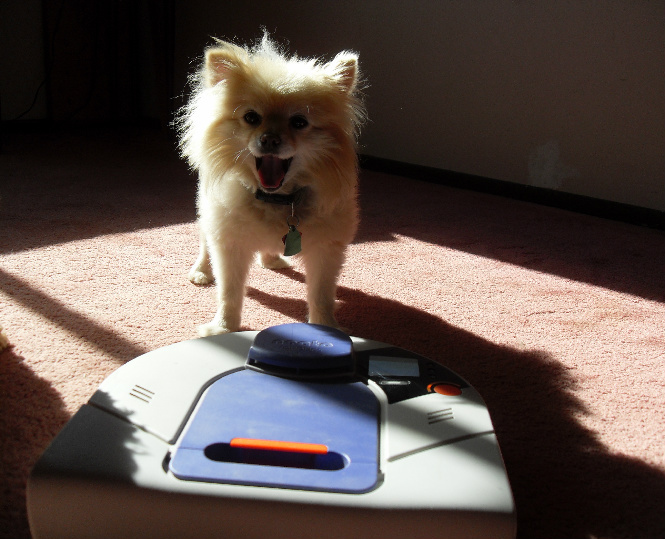 When first turning on it powers up, surveys its surroundings, then gets to work with the sort of friendly purposefulness our Pomeranian thinks he exhibits. (Except the vacuum is actually useful.) The vacuum easily fits under furniture that even super responsible kids don’t move when they do chores. It pauses in a considerate sort of way when a moving object, human or pet, passes by. It displays polite prompts on its screen like “please put me down on the floor” when picked up and asks nicely when its dust bin needs to be emptied. The contents of that dust bin are a potent reminder of how useful a Neato XV-21 can be. OMG. The first time it had to be emptied twice before recharging. But following instructions, we ran it every few days (far more often than humans vacuum around here) and sure enough, the dust bin had less debris. In other words, our floors are demonstrably cleaner. This is quite an accomplishment for a machine that’s about the size of two college textbooks. We have a big family tracking in who knows what from the barn, plus three dogs and all sorts of visitors. Yet we’ve noticed some amazing, totally unexpected Neato XV-21 side effects. My family is fond of our little robot. When it gets stuck under our couch they cheerfully pull it out. They regularly straighten up to remove obstacles that might clog our suction-happy friend, keeping the floors freer of backpacks and magazines and other messes than ever before. They clean their bedrooms so the robot has a reason to visit (it’s screen politely asking to be put down as they carry it upstairs). And here’s the most wonderful side effect of all. Because the floors are cleaner, it motivates us to do better elsewhere. It’s like the vacuum has set an example for us to follow. The sinks get wiped out more often, the couch blankets put away, the library books tucked back in the trunk, well, you get the idea. One of my kids pointed out that our house looks like we’re expecting company. Not so sure that’s true. One of my super responsible kids isn’t really keeping up with that dusting. But I’m a convert. I adore the Neato XV-21. I know the dander and pet hair has been substantially reduced around here. I can tell the floors look better. Maybe a robot-run future won’t be all that bleak. I may draw some eyes on our vacuum so I don’t feel quite so silly reminding him it to stop going under the couch. Want to win your own Neato XV-21? Tell us in the comments what you would name your own vacuum. A winner will be randomly chosen from all our clever robot-naming entries. (You will be notified by email so please supply one on the comment form.) Deadline is Wednesday, June 27, 2012.